The original Pai Gow is an ancient Chinese gambling game that is hugely popular and played throughout Southeast Asia. It is played with 32 Pai Gow tiles that look like dominoes. Basically each player receives four tiles which must be divided into two hands consisting of two tiles each. The tiles fall into two different suits called “military” and “civilian”. Players can either win on one hand or both hands. The game of poker has made its mark and has significantly gained popularity since the beginning of the 20th century. As poker became more and more popular and as casinos were legalized in different countries worldwide so to different versions of poker came about. Sam Torosian, previous owner of the California Bell Casino created an American version of the Pai Gow Chinese domino game in 1985. Pai Gow Poker also known as double hand poker is played with playing cards rather than Chinese dominoes. Sam brought together elements of old and new when creating this game and Pai Gow Poker immediately became a hit. Unfortunately due to some very poor legal advice that Torosian received he did not create a patent for this game, and so when other casinos caught on he did not receive a cent in return. Interested in finding out about some of the world’s richest casino owners? This game became an immediate favourite in California and then spread rather rapidly across the world. Pai Gow Poker has become a strong favourite worldwide in land based and online casinos. To find out more about land based casinos in the United States read this article? Pai Gow Poker is a casino game that is roughly based on the original Paigow game. Pai Gow is translated as “make nine” or “card nine” from Cantonese. The reason for this name is quite literal, the top score for any hand is of course 9. Today you can find a number of variations of Pai Gow Poker to play in casinos and online. In this game poker combinations are used to determine winning hands. The concept is simple it is however a little more complicated to learn how to play Pai Gow. This game seems to attract poker fans who enjoy a game that is a little slower, relaxing and significantly more social. Pai Gow poker also requires a bit of skill and it is probably for this reason that it attracts a lot of players as well. Not to mention that there is no chance of players losing exceptional amounts of money. Players would need to have some basic understanding of poker in order to successfully try their hand at this game. 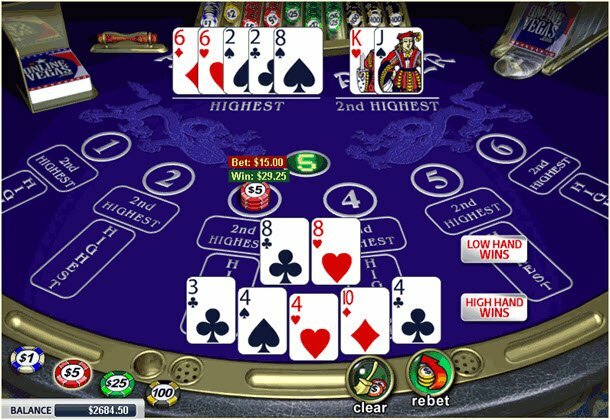 The skill in this game is to determine whether to create two fairly good hands, or to create one winning hand in order to increase the chances of winning. According to Pai Gow Poker rules it is a requirement that the back hand be better than the front hand , if this is not adhered to the hand is discarded and the bet is immediately lost. This game is played with a 52 card deck and one joker. The joker can replace an ace or a wild card and can complete a straight, as well as any flush. A Pai Gow Poker table is made up of six players and the dealer. The players aim is to beat the dealer or other players at the table. To begin each player places their bet on the table in front of them. The player is dealt seven cards - just as can be seen in the original Pai Gow game, the player is required to create two hands. One hand has five cards and the other hand has two. According to the pai gow poker rules, a player must arrange their hands so that the five card (back) hand ranks higher than the two card (front) hand. The dealer then reveals their hand. The player wins if both hands beat the bank. There are no winners if one hand beats the bank but the other one loses. In the case where either hand is a tie with the banker, the banker wins. And it goes without saying that if both bankers’ hands beat both players hands the banker wins. When the casino is the banker, the dealer is required to set out their hands according to a particular set of rules, these rules are referred to as the Pai Gow house way. In Pai Gow Poker a player can become banker at their request, the other players then compare their hands against the banker and not the dealer. When following any pai gow poker strategy things could get a little tricky, this is because in land based casinos players can request to take on the role of banker, and when playing pai gow poker online, only a few of the top online casinos offer this option. A basic strategy to follow is to separate your cards in a way that gives you the strongest possible two card hand whilst ensuring that it is not stronger than the five card hand. Of course, like in any game, there are some exceptions to this rule. When online casinos became the craze, it was only a matter of time before Pai Gow entered the online world. Pai Gow Poker online came with a set of a few of its own rules based on the nature of the game. Most of the rules have remained the same just with a few adjustments which have had a strong influence in creating the hype of playing Pai Gow poker online today.